I am Art Christensen, currently living near Somerset, WI. 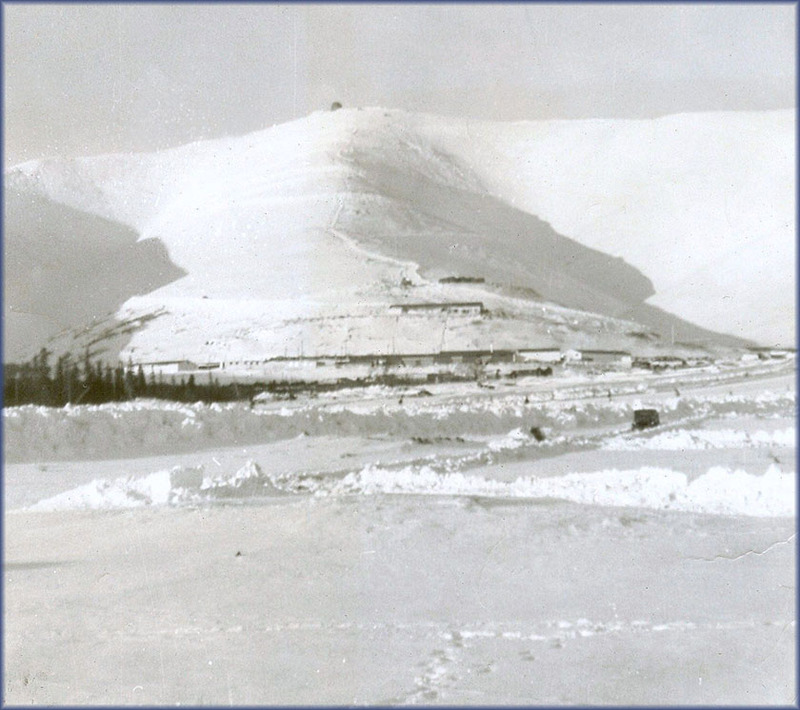 I served at the 719th AC&W Sqdn, Sparrevohn (Alaska) from late December 1956 to December, 1957. With the following contribution I hope to add something to this website. I remember that at Sparrevohn AB, there was a crashed C-119 on one side of the runway and another plane and another model on the other side, each about half way down. This was the situation when we arrived here. Right after my arrival here, a Douglas C-47 crashed on takeoff, it went into the trees at the end of the runway. Here is how I remember it. 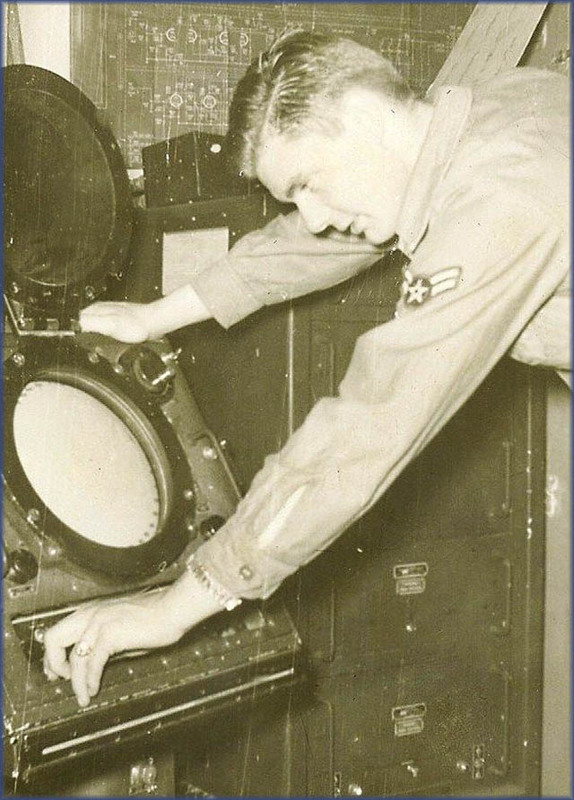 Several of us Radar personnel were flown from Elmendorf AFB to the 719th AC&W Squadron /Sparrevohn in late December 1956 for our one-year tours. We were supposed to go right to Hilltop, but the switchback road was snowed shut and it took several days to clear it. Sparrevohn gets between 3 and 4 hours of daylight that time of the year, and just after sunup a day or two later a C-47 came in with supplies. The crew and base personnel unloaded the plane and the crew hung around to visit and grab lunch. A little before sundown (around 1 PM) a few base personnel rotating out were loaded in the back and they poured on the coal and disappeared down the runway into the haze. About an hour later, one of the GI passengers who were on the plane to rotate out came staggering in to lower camp. 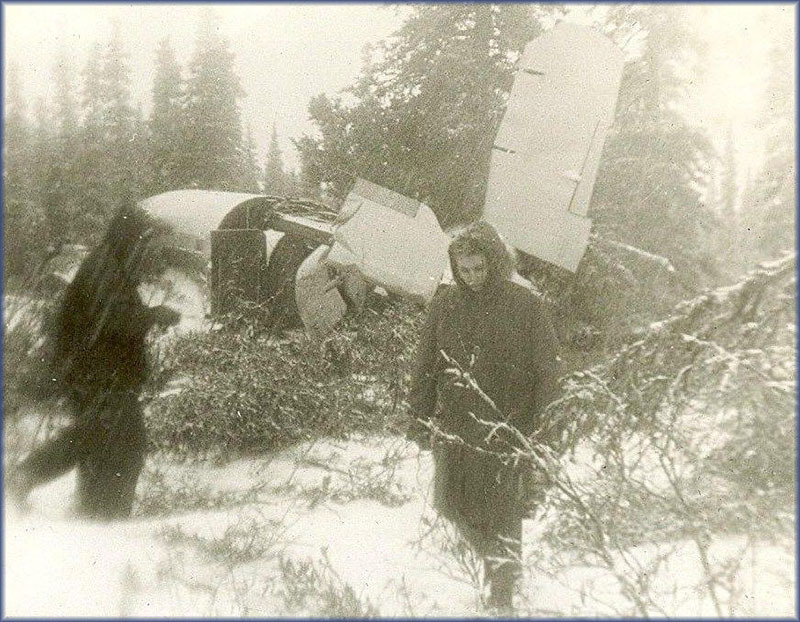 They had ploughed ½ to 1 mile through the trees at the end of the runway. None of the passengers were seriously injured, but the pilot and co-pilot were banged up pretty good. It was a week before the weather cleared enough to get them out. Meanwhile we stranded Hilltoppers were assigned as two man crews to guard the plane 24 hours a day with unloaded carbines. This only lasted a few days; apparently until they decided no one was likely to trek through 100 miles of wilderness to scavenge it. More on this further down this page. Sparrevohn, 719th Aircraft Control and Warning Squadron, fall, 1957. 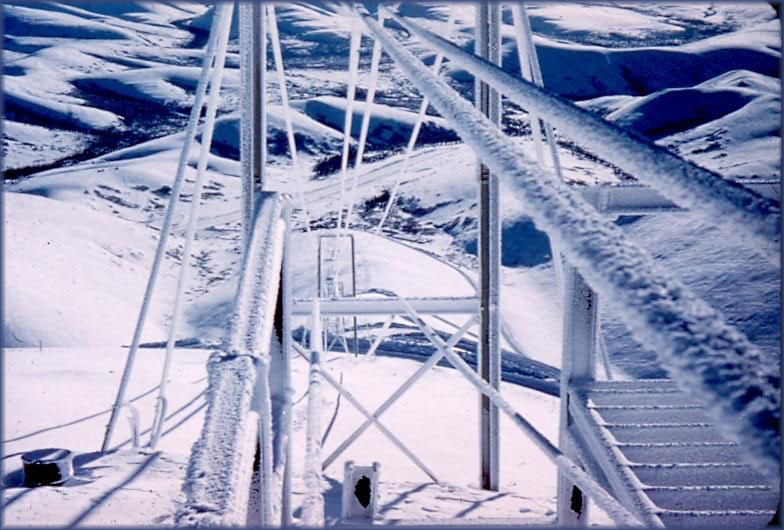 The tram towers follow the crest of the hill to its lower end, where Lower Camp is hidden just behind the lower crest. The runway butts against the hill to the left of lower camp, and extends upper-right in the picture. The C-47 which crashed on takeoff around New Years 1957 lies in the trees off the far end of the runway. 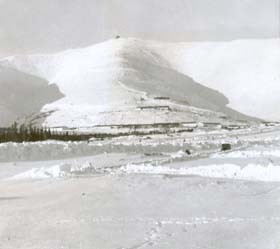 The switchback road between lower camp and Hilltop runs along the right side of the hill (by the right tram tower post on this picture) until it comes to the steep rise; then crosses left and right under the tram cables until it reaches Hilltop from the left of this picture (Its top cross to the left is hidden by the crest of the hill right in front of the camera). The road is always ascending at a fairly steep angle, but that is not clear on this picture. That steep rise was very evident when we were riding in the back of a truck. Just to the right of the distant tram tower on the ridge of the lower slope you can see a faint trail, which we 25 Hilltoppers ran down for a shower every week or so. They trucked enough water up when the road was open for drinking, shaving, the mess hall and toilets, but nothing else. A Honey bucket was on standby in case the road got snowed shut and the toilets had to be shut down. Running down was easy, but we rode the six-by truck back up. The Hilltop building is just behind the camera. This picture is from one of my 52 year old 35 mm slides. I took it from the tram door entrance to Hilltop. The tram never did work in 1957. I only know of it getting to Hilltop once while they were working on it. Sparrevohn Hilltop, from across the runway and lower camp in early 1957. The runway is just on the other side of the ridge of snow on the left of the picture, and goes up to the right side of the picture. The lower camp is just above the runway. I believe the building a little further up housed the Base generators and other mechanical items. A heavy electrical cable ran up the left side of the hill to supply power to Hilltop. We had a standby generator on Hilltop also. The switchback road hardly shows on this snow-covered picture, but is faintly visible crossing left to right. The tram towers on the ridge don’t show up either at this distance. The C-47 which crashed on takeoff about New Years 1957 lies off the end of the runway to the left. The distance from the black radome on the hill to the bottom of this picture is probably about 2 miles, maybe 3. 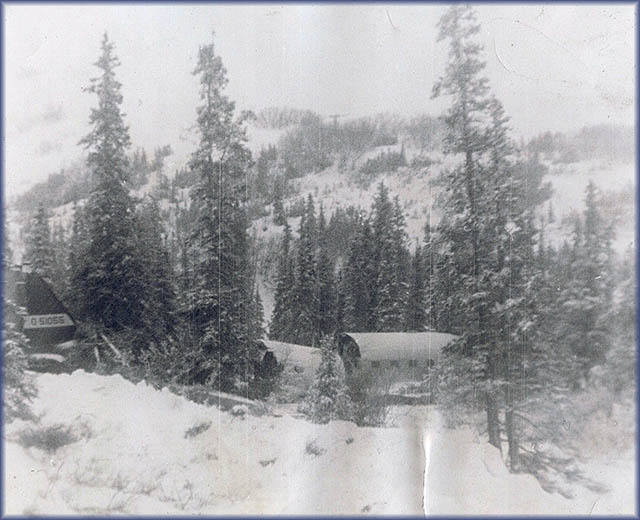 Douglas C-47 -circa January 2, 1957-, crashed on takeoff from Sparrevohn AB. It plowed through the trees and ended up here, about half a mile beyond the end of the runway. The number on the rudder is 0–51055. A half dozen or so guys who finished their 1-year tours were on board. A while after the plane disappeared down the runway, into the haze, a couple of them made it back to lower camp with the news. I heard the pilot and co-pilot were injured, but not the guys in the back. The passenger seats were drop down on each side wall with seat belts. Cargo would be secured down the middle between them. Hilltop had a photo lab where we developed and ran copies of pictures. I don’t remember if I took these, or someone else.
" The provenance of 45-1055 is clear. It spent its entire life in Alaska as per the history in the DC-3 book except that the crash date in the book is wrong. It crashed 11.2.57 (as per the website and off the record card) and not 11.2.59. Judging by the photograph and the 'J' termination code on the card that must have been the end of it as far as the USAF was concerned. I can see that it was salvageable for components but surely not as the complete airframe. Having looked at Dr Leeker's data ( www.utdallas.edu/library/collections/speccoll/Leeker/c47.pdf [page 9]) the issue is obviously N4788C's provenance. If the aircraft was falsely registered with c/n 17058/34325 and the previous identity 45-1055 that has the look of a precise and carefully researched act but deliberately sheep-dipping a C-47 in this way seems a bit OTT - in fact very OTT. However, it appears to have been obtained by Air America from/via this company in Alaska which adds something to its authenticity. A more likely guess would be that over the course of seven years someone managed to salvage the wrecked aircraft and use parts of it to rebuild another aircraft...? Maybe the CIA was simply in the market for a cheap aircraft and not too bothered about its pedigree? I would think the answer could be in Alaska: what happened to the wreck?" The temperature must have been around freezing, and the damp snow stuck. The C-47 was able to lift off the surface but could not climb. It must have ridden a ground-cushion of air pressure between the wings and ground, until it hit the trees. The fuselage was broken into three or four parts. The tail section had broken loose, just ahead of the toilet and ended up against a tree. I was stationed at Sparrevohn between 1968 and 1969. My first three months they rerouted me to the Generals Fish Camp down on the Alaskan chain. They did away with the switch back road to top camp and we went around and up the side of the mountain. During the summer there was one road up and the same road down and during the winter we packed enough snow to make two lanes in places to pass on the mountain. One of the guys that ran the mail room also ran the small BX that we had on the station. I was on the fire department also and one day we had a plane on the line taking off. We could see the plane and top camp could talk to them. I glanced up the pass and caught a glimpse of a plane coming in on landing! So I had to tell the top camp to tell the one on take off to go as fast as he could and climb as fast as he could to miss the one coming in and to tell the one landing to go as slow as he could and as low as he could. They did miss each other!